Saw this on the road near Masinagudi. 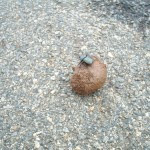 From the car, I could not make out what exactly it was and was surpised to see the speed at which the beetle was moving the ball of dung across the road. 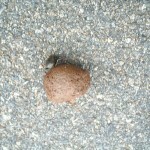 It nearly got run over by a passing car but did manage to cross the road. Ha, ha, we saw this beautiful beetle AND several elephants :)))))))...but I totally agree with you!